With less than a week to go to Akela 2016 we are rounding up our series of interviews with amazing Cubs from all over the country. 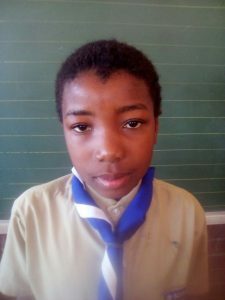 We spoke to Vuyiswa Mampe (9) from 1st Isago Cub Pack in the Northern Cape. Cubbing is so much fun because we play games and I see other children from other places. My best experience at Cubs is that I can travel a lot and that I get to see other Cubs. I ate fish and porridge outdoors. The toughest challenge for me is working in groups and lighting a fire. The most amazing place we visited was the Big Hole in Kimberley. I have learnt how to make tea. To help people in my community we gave soup to people in need and we picked up litter. I taught my mum my promise and law. A good Akela plays with the Cubs and reads stories. My Akela is special because he takes care of us! Cubbing Rocks because … It is turning 100 years old and is still going strong!